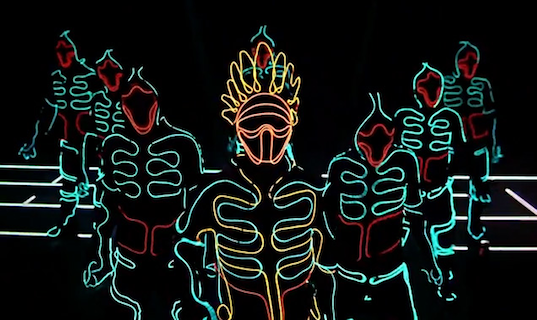 Wearable LED suits are the hottest new thing on the market, but nobody makes them look better than the Japanese dance troupe Wrecking Crew Orchestra, whose recent Tron-inspired dance routine has gone viral! Set to the likes of Daft Punk and Guetta, this high-tech cinematic performance features dancers decked out in iLuminate’s patented LED outfits that flicker on and off, making it seem like the characters disappear from the stage. Hit the jump to see them in action. Wrecking Crew Orchestra first grew to fame when they did a commercial for Experia, but nobody could have anticipated the popularity of the brilliant Tron dance which has reportedly had 200,000 hits a day. That’s a lot of people learning about iLuminate’s energy efficient LED technology, which controls 12 channels of Light-Emitting Diode Ribbon/Tape or Discrete LEDs. Batteries last up to six hours and warn users when they are fading so that the brightness doesn’t dim prematurely… wow! If you like this, then check out Jacob Sutton’s LED snowboarder for more LED fun. Wearable LED suits are the hottest new thing on the market, but nobody makes them look better than the Japanese dance troupe Wrecking Crew Orchestra, whose recent Tron-inspired dance routine has gone viral! Set to the likes of Daft Punk and Guetta, this high-tech cinematic performance features dancers decked out in iLuminate's patented LED outfits that flicker on and off, making it seem like the characters disappear from the stage. Hit the jump to see them in action.